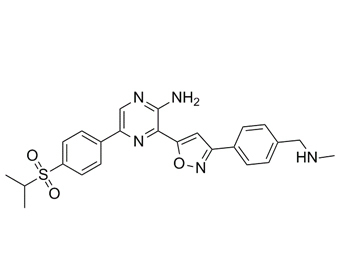 Berzosertib, also known as M6620, VE-822, VX-970, is an potent ATR inhibitor. VE-822 inhibited ATR in vitro and in vivo. VE-822 decreased maintenance of cell-cycle checkpoints, increased persistent DNA damage and decreased homologous recombination in irradiated cancer cells. VE-822 decreased survival of pancreatic cancer cells but not normal cells in response to XRT or gemcitabine. VE-822 markedly prolonged growth delay of pancreatic cancer xenografts after XRT and gemcitabine-based chemoradiation without augmenting normal cell or tissue toxicity. These findings support ATR inhibition as a promising new approach to improve the therapeutic ration of radiochemotherapy for patients with PDAC.
. Fokas E, et al. Targeting ATR in vivo using the novel inhibitor VE-822 results in selective sensitization of pancreatic tumors to radiation. Cell Death Dis. 2012 Dec 6;3:e441.